I’m going to use an analogy to explain my foray into blogging, but first you need to understand why birds fly into windows. It’s usually because birds flying toward a window see the reflection of sky or trees instead of the pane of glass; they think they are following a clear flight path. And then, WHAM! They hit the window and fall to the ground. A related problem is when birds attack windows (rather than flying into them), which usually occurs in the spring when birds are defending their breeding territories. I see this most often with the male cardinals, who will sometimes attack my vehicles side-windows when he perceives his reflection is an intruding male. HELLO WORLD! Welcome to my Blog, where I’ll share my secret confessions of being a backyard birder! 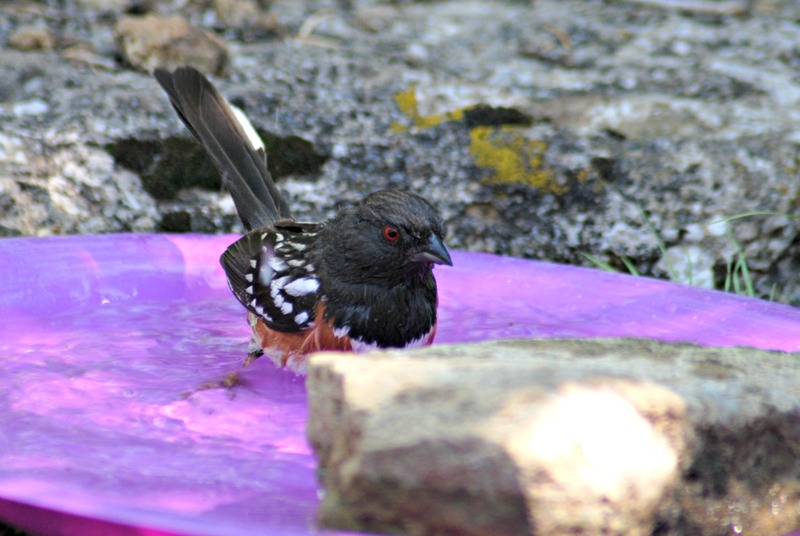 Blogging is a PERFECT idea because I LOVE my backyard birds. I’m even now a proud member of the over 65 million Americans who enjoy feeding birds in their own backyard as a convenient way to appreciate and study nature; at least that’s the statistic from the most recent Census Report. Too bad I don’t get a special certificate for this. But here’s the big question: As a first-time blogger, do I have the strength needed to bounce back from the challenges of blogging? Ornithologists estimate that up to 100 million birds are killed each year by collisions with windows. I wonder how many blogs die each year by collisions with distractions, time constraints, and competing priorities – all thought to be a clear flight path but leading to certain death for the blog. Will I have the strength to dust myself off and fly again? Will my husband come home one evening to find me dazed from hitting the bloggers window, place me in a shoebox, and leave me somewhere warm and quiet, out of reach of pets and other predators, until I recover? If I know him, he’ll probably even place a little blanket covering over me. (AWE.) Yes, he’ll care for me the same way I care for the birds, because that’s just what he does. Speaking of bird, I spotted another American Goldfinch today! They are beautiful but uncommon in my backyard. A few days ago there were four of them, and today there are at least a dozen. And, these little beauties don’t seem too particular about food. They’ve been back and forth between the suet feeder and the mixed seed. Good thing I added the thistle feeder early this morning. Okay, time to take a break. Rocky is demanding my attention. Sweet ol’ girl. Her little claws are stuck in my robe; a constant problem with Snowshoes because their claws don’t retract.